Exkee was kinda enough to send us over the brand new official game play trailer for their upcoming WiiWare title ColorZ. The game is basically an action-style puzzler that uses basic color changes as the premise for how you're able to navigate through the game's many levels. Below is a copy of the official game overview sheet sent to us along with the game play video which gives quite a bit of insight into how the game plays. ColorZ is an original action/puzzle that brings a totally new experience of Gameplay thanks to Wii capacities. The game takes place in an alternative world full of round and colorful elements but a terrible event disturbed all the citizen; a new virus polluted the universe and created thousands of microbes. You must drive your UFO friends in order to clean all the different planets. The core concept is based on common light color addition and yet to be seen multiple entities management. At the beginning of the game only Red, Green and Blue UFO are present and the player will be given control of one of them. The main rule is that one UFO can only pass through or absorb a microbe if it is made of the same color. If not, your UFO dies. Players will thus have to avoid colliding with microbes of different color, sometimes changing the color of their own thanks to basic items. The continuous multi directional scrolling movements of the camera will guide and force the player to advance forward in all levels. Controlling the different UFO will be done using the Wii Remote pointer, the Nunchuk and the Wii Remote +Control Pad, with a very progressive learning curve so that players get accustomed to it. The combination of multiple UFO and color management will add thrilling puzzle solving phases to the game. 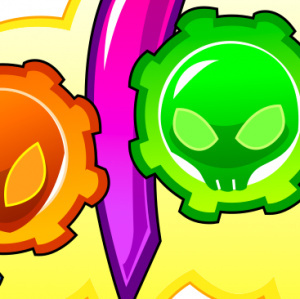 It will challenge player’s reflexes to avoid colliding with microbes as well as their intuition and smartness to fusion the right UFO and obtain the appropriate color when required. Thanks to this unique feeling, ColorZ will also improve player’s limbs coordination and greatly foster their reactivity. Multiplayer also has great potential and will be an important aspect of the game. In fact, up to three persons will be able to play in cooperation mode, each player being given control of one UFO. They will thus need to constantly talk to each other and make up strategies on the fly in order to solve all the color based puzzles and stay alive. Conviviality and fun is guaranteed here! This multiplayer mode will also attract a great amount of dormant, leisure and casual players to the title. Just imagine a father and son cooperative play full of exchanges: it will progressively rally the family all together around the Wii for great amount of fun! With its twenty colorful and non violent levels, its pleasant atmosphere full of original puzzles, its fast pace action phases and convivial multiplayer mode, ColorZ will attract a wide audience and will sure bring a great dose of fun on WiiWare! This is one upcoming WiiWare title that's starting to look very interesting. The game play idea seems unique and the Wii Remote control looks like a perfect fit. We'll keep you posted any any new information on ColorZ as it becomes available, as well as a full review when it hits the WiiWare service. For some reason it reminded me a bit of Ikaruga in the way the rapid color change is the only way to survive for very long. Seems pretty cool and one I'll definitely be keeping an eye on. Awesome... pure awesome. It looks so addictive, though. I think I'll lose my life if I get this. I was going to mention Ikaruga as well, Corbie - definitely borrows the colour-swapping element from that title, though it'll be interesting to see how it applies to a casual game. This looks really cool. However, this game should include the Motion Plus for optimal gameplay. Did Exkee say anything about Motion Plus in their game, Corbie? No mention of it. You see every bit of information we received on the game. Whoa, where did this come from?! It sure looks trippy and cool! I'm glad its not just another shovelware title because I almost dismissed it as such! This trailer shows real potential so I'll have to keep an eye on this one as well! Looks like it could be fun but...Where's my WiiWare Meteos with local/online play? I'd love to see a WiiWare Meteos game. BIG TIME! @ Crazed: What could Wii Motion Plus possibly do for this game? Absolutely nothing as it seems to be best played by pointing at the screen..
Not my kind of game, again another puzzler, but I can see this having legs. It looks pretty cool, now the controls need to work. This looks very interesting, but I'm apprehensive about the "control two UFOs at once" thing. That really sounds like a recipe for overcomplication. However! If they can pull that off, this game looks like it could be loads and loads of fun. I already like the puzzle elements we've seen just in those short clips. My fingers are definitely crossed for this one. It doesn't look very puzzly or "casual." Looks pretty intense to me! And the Ikaruga comparisons seem spot-on. I will definitely be getting this! The game looks interesting, though. Reminds me a bit of Schizoid except with more colors. For what I saw there's a lot of things going on in there, it certainly look too intense, the kind of game where you need to practice a lot to complete a level, Cool! . this game looks very nice, i really like wat im seeing, i can see maybe a top 5 standing on the weekly board not the week of release but the week after. anyone agree? That looks like it's going to be pretty challenging; the visuals definitely look nice. Good to see some more nice games coming out of France! This game looks like it could be really fun multiplayer in the harder levels. I can see lots of opportunities to be yelling frantically at each other! @KeeperBvK- Motion plus would benefit this game since the game uses the Wii pointer, and since there will be tons of color-swapping it would be frustrating if the current sensor missed the fact that you wanted the characters to combine into a new color, therefore having both characters get shocked. Yes, you could also play with the other control options, but there (hopefully) shouldn't be a difference between preference of gameplay. It definitely looks like a mix of Ikaruga and Mercury Meltdown Revolution. The gameplay looks interesting, but those pointer controls seem completely untolerable. Add in classic controller support; one joystick per UFO would work PERFECTLY for this game. Or at least make it so the UFO is exactly where the pointer is, instead of lazily following it around. Crazed: Motion plus adds additional gyros/accelerometers. It changes NOTHING with the IR sensor; that would require either a replacement of the camera in the Wii Remote or some change to the sensor bar, or both. Oh, that's my bad, then. I misunderstood what the MotionPlus was. Thanks for the notices. On topic... I'm glad this game is (currently) doing well. Hopefully, since Exkee a French developer, it will come to America quickly after Europe. It seems a great game... it will be mine!